1Cut out two ears from the white poster board that are each about 12cm tall and 5cm wide. 2Cut out two smaller ears from the pink construction paper. 3Glue the smaller ears inside the larger ears, or colour the inside of the larger ears pink. 3With one of the paper plates right side up, glue the ears to the top of the plate so the pink part is facing the table. 4Turn the paper plate over. 5Put a dollop of glue in the second paper plate. 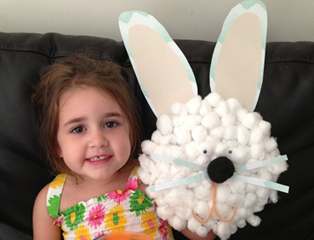 6Dip cotton balls into glue and then stick onto plate with ears… the more you use the fluffier your bunny will look! 7Glue the googly eyes, pompom (nose) and 2 pipe cleaners crossed, (or paper) whiskers onto the face of the Bunny. 8Bend two pipe cleaners into the shape of the bunny’s mouth and glue under nose. *We attached a ribbon to each side of the plate with sticky tape in order to hang.